Although Jim Black’s host of appearances as a sideman or bandmate are more than enough to cement his credentials as one of the most important drummers in the last twenty or so years (ask Ellery Eskelin, Tim Berne, or Satoko Fujii about Black’s value as a percussionist), his projects under his own name have not always received the same level of acclaim. This record, Black’s third with this lineup, may help change that. By combining an uncompromising melodic sensibility with Black’s typical rhythmic adventurousness, this music manages to be both engaging and challenging at the same time. Music for both the heart and the mind, essentially. The first thing that strikes one in listening to this record is the staying power of the melodies. Three of the ten pieces (“High,” “Medium,” and “Low”) are built around the same theme, a subtle, melancholy tune that is hard to get out of one’s head after hearing it a few times. On these three cuts, Black and his partners see how far they can stretch the melody before it breaks—and it never quite does. The same goes for the other tracks on the record: each tune is developed in different ways, sometimes by presenting it straightforwardly and then deconstructing it, and sometimes by teasing it out more gradually. 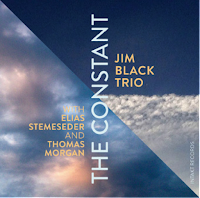 The rhythmic variation is also noteworthy, as one would expect on a Jim Black record. Driving rock rhythms alternate with abstract brushwork or other interesting percussive effects, often on the same track, serving as a springboard for collective improvisation that goes just far enough to feel a bit disorienting, before eventually coming back, always, to the melody. Particular mention must be made of Black’s colleagues, both of whom are superb. The better-known figure here is Thomas Morgan, who’s been getting some press lately for his contributions on bass to recordings by Craig Taborn, Dan Weiss, and Tomasz Stanko, among others. Morgan comes straight out of the Charlie Haden school, with a strong emphasis on the melodic side of the instrument. He thus fits perfectly with Black’s concept here, as one can hear as he opens the record on “High” by establishing the tune with poise and understated grace. Throughout the record, he is as likely to provide a deliberate, carefully presented melody as he is to launch into nimble flourishes (although he can certainly do that too). 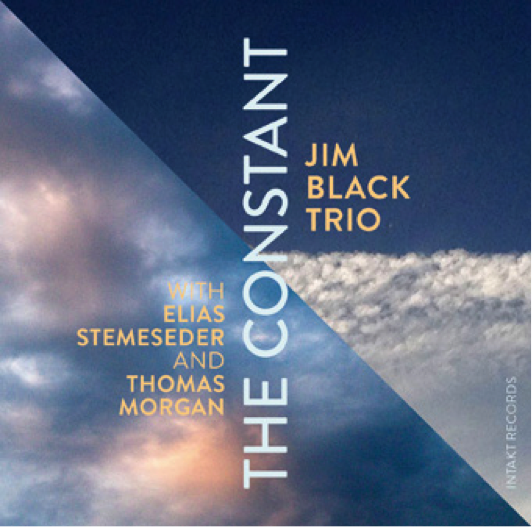 The relative newcomer here is the pianist, Elias Stemeseder, who in addition to playing with Black’s trio has worked previously on a couple recordings with Anna Webber. Although he’s definitely developing his own voice, he brings Keith Jarrett instantly to mind through his dexterous fluidity and lush romanticism. But he also has a few twists to offer: listen to his feisty prepared piano on track two, “Song H,” as evidence. All told, Black has the perfect associates for this music, and together the three work as one throughout the record. Even the album’s closer, the Jerome Kern-penned “Bill,” is a tribute to the band’s ability to draw new dimensions out of an old classic. A record worth enjoying and savoring, this release is sure to please Black’s current fans and win him a few new ones as well. Agreed, an enjoyable album. A thoughtful review, and the antecedents are spot on. Elias Stemeseder is a name one should keep in mind. He is only 26 years old and one of the great talents in German jazz. Really nice review, Troy. I'm just getting around to this one, and you gave great context. Thanks!